As we probably all know by now, former Ubuntu superstar Jeremy Fox has taken up residence at Rustic Canyon, quite comfortably I might add. However, you might have forgotten that before Rustic there was Barnyard, the restaurant that the Chef was supposed to helm before suffering a rather public falling out with management back in November. With Fox out of the picture, owner Jose Bunge has brought in former Tasting Kitchen CdC Jesse Barber to take the reins. About the Chef: Jesse Lawrence Barber grew up in Oregon, and after graduating from Sheldon High School in Eugene, attended Lane Community College to study psychology. He didn't graduate though, instead choosing to focus on a career in the culinary arts. 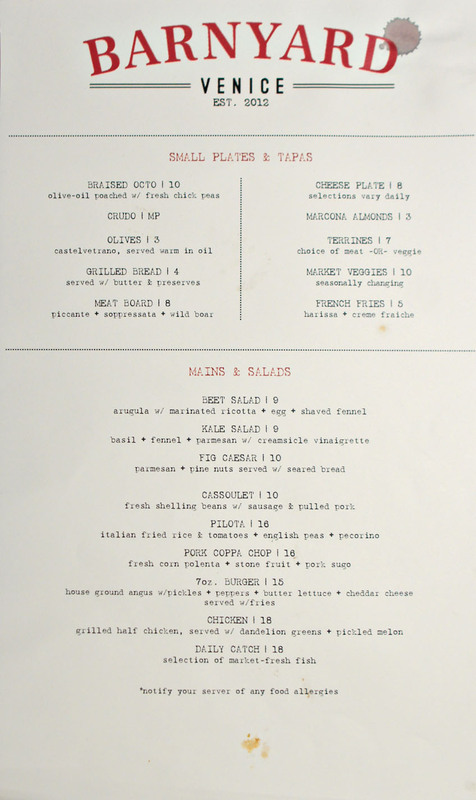 In 2000, Barber began working at Bouchon and The French Laundry, serving as a commis, garde manger, and eventually, line cook. He completed his formal training at the Western Culinary Institute, finishing in 2003, then spent some time at Marché Restaurant in Eugene. Barber's next move was in 2005, when he took on a position at Bluehour in Portland. He left there in 2008, worked a brief stint at the vaunted Clarklewis with Casey Lane, then started at Decarli in Beaverton as a Sous Chef. 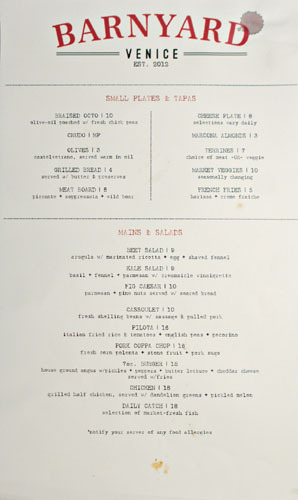 In June 2009, Barber relocated to Southern California with Lane to become his Chef de Cuisine at Abbot Kinney game-changer The Tasting Kitchen, but would leave by mid-2011 to start his own project, entitled Spilt Dinner. 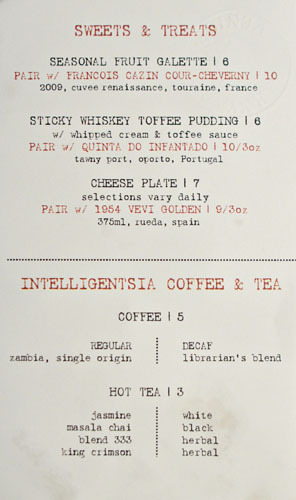 Spilt gave way to Assembly Restaurants, a collaboration with TK Wine Director Maxwell Leer (Bestia, LudoBites, The Bazaar) that would dissolve in September 2012, around the time that the Chef got married. Following Fox's departure, he became attached to Barnyard, the restaurant debuting on February 1st with wife Celia Barber (née Woodburn) on board as General Manager. Barnyard's menu is sort of exactly what you'd expect in Venice, showcasing rustic-ish, farm-to-table-y plates meant for sharing. Click for a larger version. 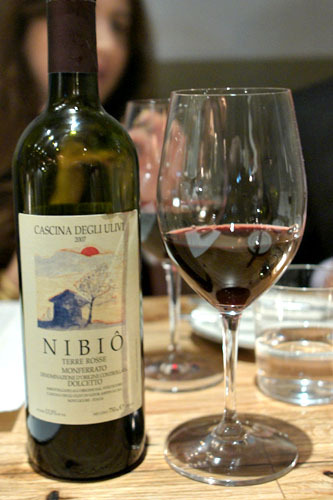 To drink, we went with a bottle of the 2007 Cascina Degli Ulivi Piemonte Dolcetto Nibiô [$67]. This one was on the tannic side, with a balance of dark fruit and a dry, slightly earthy, astringent character on the back end. 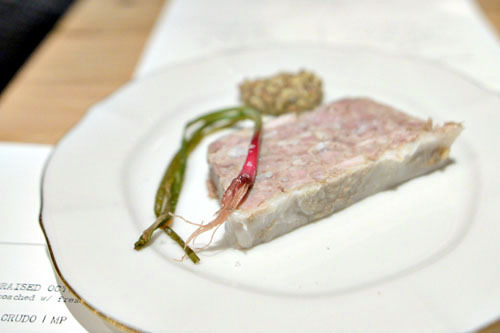 We commenced with Barnyard's take on the classic pâté de campagne, a coarse, gritty, salty presentation of the dish, with a definite piggy goodness to it that made perfect sense with the whole grain mustard. 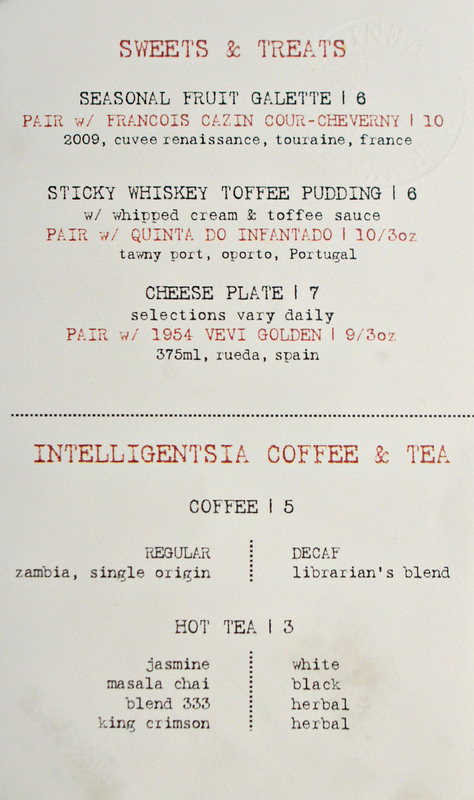 Perhaps a bit less spicy, a bit less earthy than some other versions I've had. Crudo featured two cuts of fish. First was halibut, which arrived soft, supple, and expectedly mild on the palate, making it a good pair with a dab of the spicy dressing on the plate. 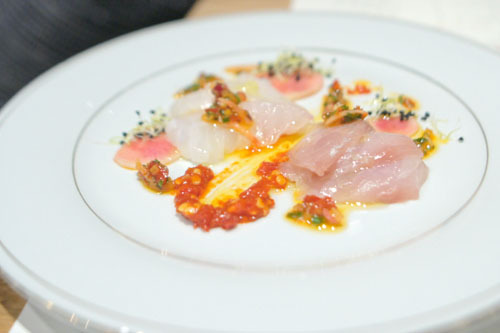 The yellowtail, not surprisingly, showed off a fattier, fishier flair, with a more pronounced taste that worked with the lighter nuances and crunch of the radish. 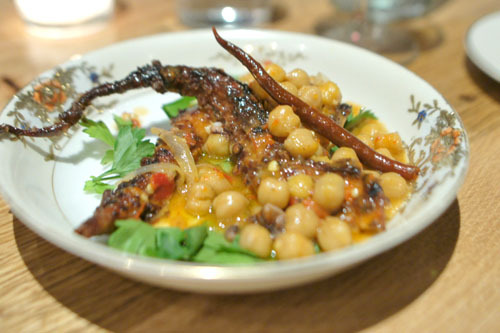 Octopus was one of my favorites tonight. It came out nicely charred and a bit crunchy, with a savoriness to it that worked hand-in-hand with the sweet, spicy undertones in the dish. Really appreciated the chickpeas here as well, which did a great job moderating all the flavors at play while adding a bit of heft at the same time. 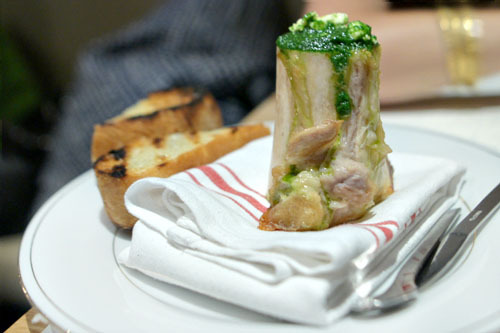 Bone marrow was a special this evening, one that we obviously had to try. It was a classic presentation of the ingredient, with the marrow coming to us trembling in place, slick and fatty, with a pronounced richness to it that was beautifully balanced by the piquancy of the salsa verde. Very good over the included toast. 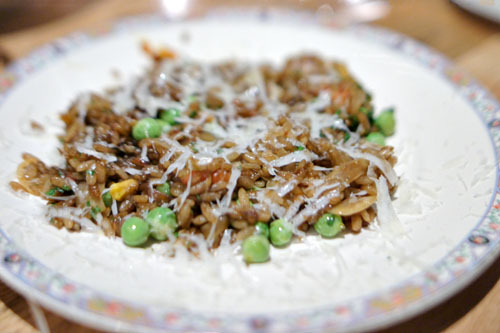 Next was an uncommon version of risotto, which, as the menu states, really did amount to a sort of Italian fried rice. It was quite tasty though, something that I could just eat a big bowl of, with the firm, near crispy grains of rice melding well with the sweetish notes of the tomato and pea, all while the cheese added a bit of kick to the course. 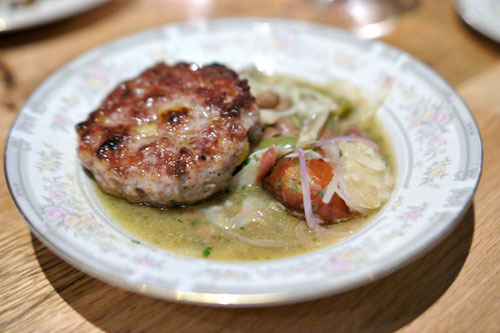 The cassoulet was comforting, in particular the sausage, which was akin to a hamburger patty in terms of its texture and satisfying savoriness. Unfortunately I didn't get much from the pulled pork, though I did quite enjoy the weight of the beans in the dish, as well as the balance provided by the veggies. 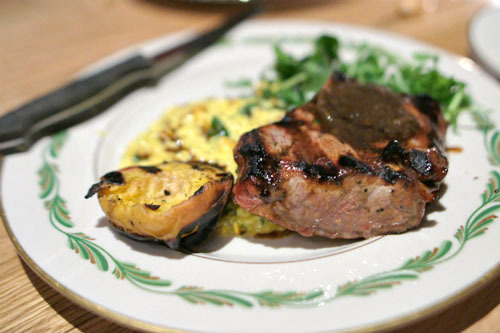 The pork chop showed off a nice char to it, with an astringency that paired well with the meat. The chop was tender, juicy, and easy to eat, though the sweetness from the stone fruit I found distracting. Nice polenta though, and I did appreciate the levity and zing imparted by the greenery. Nothing wrong with the burger, either. 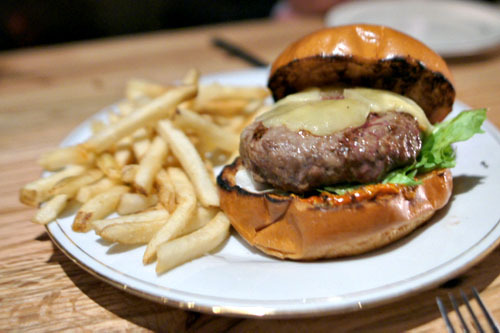 It was a pretty classic take, with the properly beefy patty playing off of the cheddar, all underneath some tangy overtones of mustard. Pickles and lettuce completed the combo, which was effective though perhaps unexciting. Nice fries, too, though I wasn't as keen on its dipping sauce. 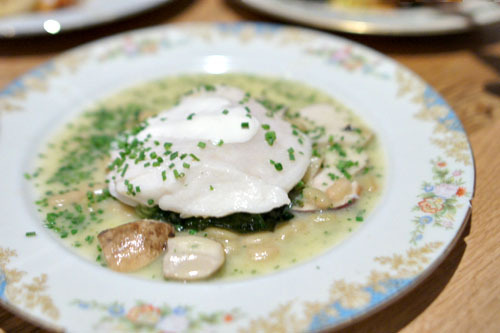 Halibut was another special of the evening, and arrived cooked with Vouvray. The fish itself was as soft, supple, flaky and mild as you'd expect, and functioned as a fitting counterpoint to the savoriness of the porcini and fava present. My complaint here was that the bit of sauce atop the fish (crème fraîche perhaps?) rendered a certain tangy sweetness that just seemed off to me. Dessert was a must, natch. Click for a larger version. 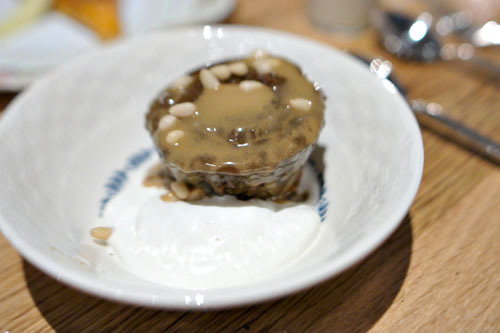 I enjoyed the pudding, finding it properly moist, with its mix of sugary and boozy flavors melding well with the comparative lightness of the cream here, all while the pinoli added some well-placed nutty nuances to the dessert. The galette was actually surprisingly delish, with a very pure, very pronounced apricot flavor that really captured and conveyed the essence of the fruit. 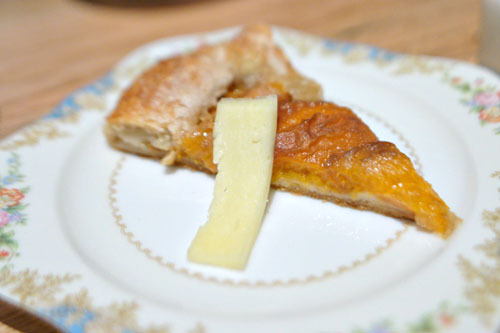 Combined with the flaky crust, it formed a winning combination that was even better when taken with a bit of salty cheese. Though Barber's cooking isn't as ambitious as what Jeremy Fox was going to put out here, Barnyard I think still works pretty well. It's a cozy sort of neighborhood place, with Cal-Med-ish cooking that's tasty and just compelling enough. Service was on point as well, making for an overall pleasant experience. Interestingly, word on the street is that Barnyard's owner is taking over the building next door as well, so I'm curious to see where that goes. Nice Review, Original Rustic, Great Photos.